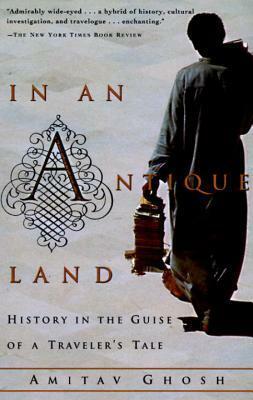 In an Antique Land is a brilliant hybrid, a subversive history in the guise of a traveller's tale. It tells the story of two Indians in Egypt. The first was a twelfth-century slave; the second is Amitav Ghosh, who stumbled upon the slave in the margins of letters that were written by the slave's master. His curiosity piqued - even ill-defined, the slave's presence in the records of medieval history was completely out of the ordinary - Ghosh journeyed to Egypt in 1980 to try to fill in the details of the slave's life. His search - which would last for ten years - began in a tiny village two hours from Alexandria where Ghosh found himself among people for whom 'the world outside was still replete with wonders of the unknown.' There was Abu-Ali, his gargantuan landlord; Khamees the Rat, the beady-eyed local wit; his adversary, the Imam; Zaghloul the weaver (once so obsessed with a girl that he spent his nights kneeling outside her window to listen to the sound of her breathing); and young, quiet Nabeel, who would be left stranded in Baghdad at the outset of the Gulf War. These were zealous Muslims who found him, a Hindu, fascinating but utterly incomprehensible. Yet they willingly became his guides as he sifted through fact and conjecture, piecing together the slave's journey from India to Egypt. Ghosh discovered an 'elusive and mysterious acquaintance' in the slave, with whom he seemed to share, across eight hundred years, the experience of dislocation, and who seemed to have given him 'a right to be there, a sense of entitlement.' And, moving between the present and the ancient past, between his own life and the slave's, Ghosh creates an exuberant multi-layered narrative, rich in detailand anecdote, that affords us not only an inkling of the slave's life, but also a unique understanding of the private life of the world that both he and the author came to inhabit. Amitav Ghosh was born in Calcutta and spent his childhood in Bangladesh, Sri Lanka, and northern India. He studied in Delhi and Egypt and at Oxford and taught at various Indian and American universities. The author of five non-fiction books and eight acclaimed novels, Ghosh has also written for Granta, The New Yorker, The New York Times, and The Observer. He lives in New York City with his wife and two children. His titles Sea of Poppies, River of Smoke, and Flood of Fire received critical acclaim.